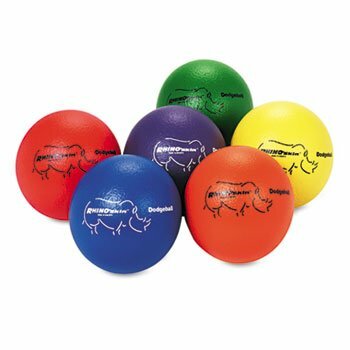 Dodge Ball Set, Rhino Skin, Assorted Colors, 6/set by Champion Sport at Scruffs Game. MPN: MTRXD6SET. Hurry! Limited time offer. Offer valid only while supplies last. Features Rhino Skin so that even smaller kids can get a secure grip on the ball. Brightly colored balls offer high visibility for play, day or night. Features Rhino Skin so that even smaller kids can get a secure grip on the ball. Brightly colored balls offer high visibility for play, day or night. These 6-inch diameter balls are designed for heavy use. Includes one each: blue, green, orange, purple, red and yellow. Includes one each blue, green, orange, purple, red and yellow. If you have any questions about this product by Champion Sport, contact us by completing and submitting the form below. If you are looking for a specif part number, please include it with your message.